From Florodora to the Latest Broadway Sensation! Studio Cast, 1995 (Angel, 2CDs) No stars; not recommended. 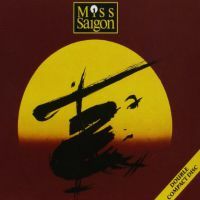 The CD booklet notes assure us that there was much more to the success of Miss Saigon than the stunning onstage simulation of the landing and takeoff of a helicopter. Yet this recording begins with the whirring of chopper blades, as if to admit: “Yes, that special effect is what most people will remember about the show.” Billed as a “complete recording,” it includes revisions of the score that were made following the London production. The cast, drawn from several of the show’s worldwide productions, is backed by a huge orchestra. Joanna Ampil’s Kim is very much in the Lea Salonga mold, which is a good thing. The partly Asian Kevin Gray brings credibility to the role of the Engineer, but even he can’t triumph over such dreck as “The American Dream,” a hit-them-over-the-head number in which the title phrase is repeated 18 times. Like his recorded predecessor in the role of Chris, Peter Cousens, from the Sydney company, has a fine voice but is unable to sound convincingly American. 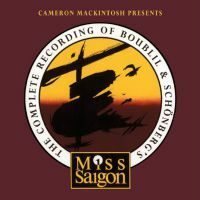 Hinton Battle sings John’s “Bui Doi” for all it’s worth, which is very little, and the thankless role of Ellen is well handled by Ruthie Henshall. The orchestra, conducted by David Charles Abell, plays beautifully, and the sound quality of the recording is superb, but it’s all in service of a score that deserves to be consigned to the musical theater junkyard. — M.P.